Vertigo is a problem that is usually associated with an imbalance in the inner ear and can lead to feelings of dizziness, nausea or a feeling that you or your surroundings are spinning or swaying. Vertigo should not be confused with a Fear of Heights as the feeling that you might have when looking down from a great height is not the same. Whilst this condition is not usually serious you should seek medical advice if it is recurrent or persistent. Assuming that you or your client has been given the all-clear from your GP then there is a possibility that this may be a psychosomatic condition. 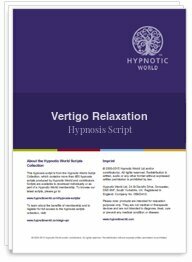 Anxiety or stress may also play a part in vertigo and hypnosis can help, and during the deeply relaxing feeling that is induced with hypnotherapy, you will be guided to a place deep within your subconscious mind where you can discover the cause of your vertigo and rectify it.